The Bacterial Endotoxins Test (BET) is an in vitro assay for detection and quantitation of bacterial endotoxins, a component of the cell wall of gram-negative bacteria. The BET is performed as part of the lot release testing for medical devices with direct or indirect contact to the cardiovascular system, lymphatic system, or cerebrospinal fluid. Injectable pharmaceutical products must also be tested for bacterial endotoxins. Routine monitoring of water systems and incoming materials can help to ensure that the process does not contribute endotoxins to the final product. This assay is also known as the Limulus Amebocyte Lysate (LAL) test and is sometimes referred to as the pyrogen test (because bacterial endotoxins can cause a fever in mammals, including humans). However, the BET should not be confused with the rabbit pyrogen test described in USP chapter <151>. All testing meets the requirements outlined in USP chapter <85>, USP chapter <161>, ANSI/AAMI ST72:2011, EP 2.6.14, and the FDA Guidance for Industry Pyrogen and Endotoxins Testing: Questions and Answers. Nelson Labs is an industry leader in bacterial endotoxins testing. We can provide test results the same day of sample receipt. For routine testing, results can be completed the day following sample receipt. Our validations and method development studies are done thoroughly with a process that has been proven effective and compliant. With over 25 years of experience, we are happy to help resolve any questions you may have about the test criteria, and can also help with failure investigations and evaluation of the manufacturing process. The Bacterial Endotoxins test can be performed by the kinetic turbidimetric, kinetic chromogenic, or gel-clot test methods. However, the kinetic test methods have significant advantages over the gel-clot test. Sample extractions: Device extractions are performed using water free of detectable endotoxins. The extraction process involves flushing and/or washing the devices with the minimum amount of liquid to properly extract the device. Devices with a non-pyrogenic fluid pathway are extracted by flushing the relevant fluid pathway with extraction liquid that has been heated to 37 ± 1°C and maintaining contact for not less than one hour. Device immersions are performed by washing the devices in extraction liquid at 37 – 40°C for >60 minutes with intermittent swirling on an orbital shaker. Test procedure: A BET involves analyzing the liquid sample or sample extract using Limulus Amebocyte Lysate (LAL). LAL is a reagent made from the blood of the horseshoe crab. In the presence of bacterial endotoxins, the lysate reacts to form a clot or cause a color change depending on the technique. The test sample is compared to a standard curve made from known endotoxin concentrations. All tests are performed in at least duplicate. 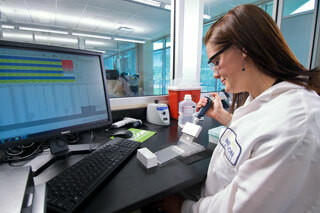 A positive product control and negative control are included as part of each assay. Validation: It is required to demonstrate that the test sample does not interfere with the ability to detect endotoxins. This is accomplished with the positive product control (also called the spike recovery) for the kinetic test methods, and with a separate inhibition and enhancement assay for the gel-clot test. Samples that require a treatment such as reconstitution in a solvent other than water, heat denaturing, centrifugation, or filtration should be validated to demonstrate that the treatment does not result in the loss of endotoxins. This is accomplished by inoculating the sample with endotoxins and subjecting the inoculated sample to the chosen treatment. The endotoxin limit for medical devices is not more than 20.0 EU/device unless the device will have contact with cerebrospinal fluid, in which case the limit is 2.15 EU/device. Ophthalmic implants and OVDs may be required to meet a lower limit of 0.2 EU/device or 0.2 EU/mL. Endotoxin limits for pharmaceutical products are based on the maximum dose that can be administered in a 1-hour time period. If you have additional questions about Bacterial Endotoxins Test (BET) services, or would like to consult with the experts at Nelson Labs, just send us a request or call us at +1 (801) 290-7500.